This homemade mini or Slider Buns are soft and taste really good. They are great for Cheesesteak sliders or Mini burgers. Put the warm milk and water in a mixing bowl. Add sugar, stir to dissolve and add the yeast. Stir to mix. Set aside for 10-15 minutes or until the yeast mixture is frothy. Place 1/2 portion of the flour, sea salt, egg and melted butter into the yeast mixture. Mix well and gradually add the remainder flour. Knead the dough for about 12 to 15 minutes until it is smooth and elastic. Place the dough in a lightly oiled bowl. Cover the bowl with a piece of cling film and set aside in a warm place for about an hour or until the dough has doubled in bulk. Press the dough down and divide the dough into 15 pieces. Gather the dough into round ball. Place the dough on baking pan. Let the rolls rest for about 30 to 40 minutes. Bake the rolls for about 15 to 18 minutes. 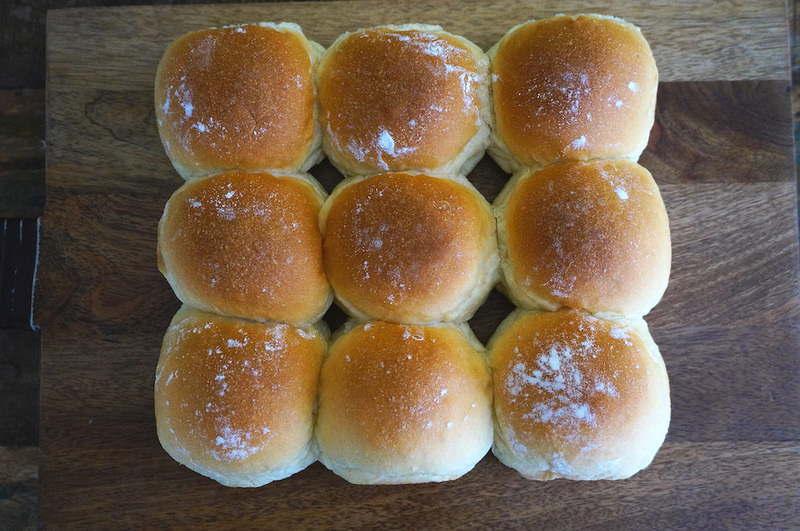 Remove the rolls from the oven, and serve warm or at room temperature.